I’m putting together a series of short guides for different clients on how to use social media tools in shared learning and online outreach. These will be a mash-up of my existing practical One Page Guides with a bit more theory on effective use of social tools. One of the important bits of theory I want to try and get across is around network effects. Often the reasons given for using a given social media tool focus on the ways they are used once a network effect has kicked in: once, for example, lots of people have started following a Twitter account, or once a network of residents has grown big. However, when you start using a social media tool – particularly if your interests are in sectors other than technology (community music for example) – there is often a slow lead in before the network effect starts generating dividends from the time spent using the tool. Thus, it can be important to offer a different motivations model for using new social media tools. You will probably notice, from the paragraph above, that I’ve not found a great way to communicate this point.. and I would really value your input. Below is what I’ve written for one of the guides so far, but it’s much in need of a re-write. How could this be better said? Or should I be saying something else entirely? Many social media tools have a network effect. For each extra person who starts using them they become more useful (for example, the first telephone landlines had a big network effect – when only one person had a fixed line, it wasn’t all that useful a thing to own!). When you start using a new tools you may not have a ready-made network to join in on. If you focus on making new social media tools work well for you in your existing day-to-day work, then when the network effect kicks in it’s an added bonus. For example, with social bookmarking, you can switch from saving your favourite links on your own computer (or scribbling down websites you must go back to look at on little scraps of paper), to using delicious to save them in a public online space. This is useful to you – as it means you can find your favourite links from any computer. But it also brings a possible network effect. You might find people with shared interests who have bookmarked the same links as you. Or you may start to find a shared ‘tag’ to add to your bookmarks which helps you share information with an informal network of other users of the service. If you start using a new tool only for the network effect, and you expect to get instant benefit from it – you may be disappointed. Networks are like communities, they take time to develop and grow. However, if you use a new social tool and weave it into your day-to-day practice, then you are sure to find a new connections, ideas and opportunities emerge over time. I recently co-designed and fascilitated a series of dialogue events for The National Youth Agency (NYA) between young people, officials from the Department for Education and Skills (DfES) and Parmjit Dhanda MP (then Minister for Children and Families). We focussed the dialogues, which were part of a broader UK tour by Parmjit Dhanda, on the Local Offer. This should be out of school, and local authorities are responsible for making sure there is provision, it is well publicised, and that young people can access it. Young people should also be involved in influencing what is provided under the Local Offer. Explores some of those methods of influence and accountability in more depth – exploring how potential barriers might be overcome. The resources we developed for the session are fairly flexible – and so I thought I would share them here – as they may well be useful to local areas exploring the local offer, or others running consultation processes related to activity provision for young people. We used this set of 10 ‘Local Offer Bingo’ cards as our ice-breaker name-game. Simply give everyone a card, and ask them to talk to each other and to write down someones name against an activity if that person enjoys that particular activity. Each name can only be used once, and you need to find someone for each of the 16 squares on the card. The first person to fill their card (i.e. to find 16 people’s names) shouts Bingo! After you’ve completed the name game – you can use it to take about the sort of activities people enjoy – and how they now have a right to positive activities in their areas because of the local offer. The list of activities came from young peoples suggestions in an earlier NYA consultation on Youth Matters. You can download the cards for printing as a PDF, or for modification as a Word Document. 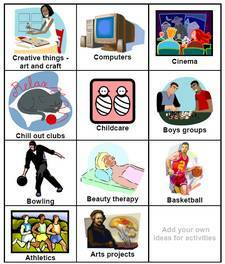 These cards add a bit of colour, and list all 47 of the activities used in Local Offer Bingo along with a suitable clip-art image. We then asked groups to pick up Local Offer Cards that represented things they enjoyed doing, and to place them on the map if there were places where they could carry out that activity. 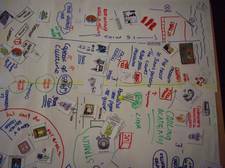 We used the picture that built up to shape discussions around what was and wasn’t available in the local areas members of the group came from. We also had some stickers with icons and words relating to different barriers that might stop young people accessing activities. Things like ‘cost’, ‘transport’, ‘time’, ‘traffic’ and ‘attitudes of adults’. For some groups we asked them to add these on top of the map to show where barriers to accessing activities existed. The cards and mapping excercise were really useful in starting discussions and making sure that everyone could have a say, regardless of whether they were comfortable with the written word and verbal expression or not. I’m sure there are many other uses for the cards as well as in mapping; for example, using them to prioritise the different sorts of activities a group would be interested in having provided, or adding ‘costs’ to them and getting a group to try a budgeting excercise thinking about how they would ensure provision of a wide range of activities. You can download the cards for printing as a PDF for printing, or for modification as a Word Document. Possible modifications: Give each card a ‘cost’ score according to how expensive or resource intensive that activity is to provide (like in David Wilcox’s Social Media Game) and encourage a group to try an budgeting excercise to work out where their activity priorities lie. This is a really simple tool – and I was suprised by how well it worked. How could you influence local authority decisions about provision under the local offer? How could you hold responsible decision makers to account for provision under the local offer? (we used different ‘translations’ of the questions depending on the focus that had emerged earlier in the dialogues… but these are the overarching questions we were getting at). We wrote the themes in the header box of these problem solving charts that we’d had printed on A1 before the event (rather than just scribbling them up on flip-chats) and, after introducing the charts, asked members of the dialogue to select which theme they wanted to discuss and to go over and have a conversation around it. As fascilitators, we just stepped back. The charts appeared to really help most groups self-fascilitate and to record some really good points. 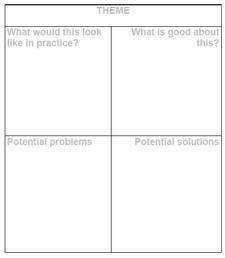 In particular, encouraging the group to answer the question “What would this look like in practise?” with a narrative about how their ideas would work really helped them to work through the other boxes on the chart. were important elements of the charts working as well as they did. They cost us just Ã‚Â£1 each to get printed on A1, which was well worth it. You can download the chart as a PDF here, or as a Word document for modifying.